TOKYO - Japanese nuclear officials said Thursday that three workers were exposed to radioactive elements and injured at the nation's tsunami-crippled plant. Fumio Matsuda, a spokesman for the nuclear safety agency, said the three workers were exposed to radioactive elements while laying electrical cables Thursday at the Fukushima Dai-chi plant. Two of them were exposed to radioactive elements on the skin of their feet, and taken to hospital for treatment. Matsuda said the workers were exposed to radiation levels of up to 180 millisieverts, which is less than the maximum amount of 250 millisieverts that the government is allowing for workers at the plant. About two dozen people have been injured since the plant began leaking radiation after suffering tsunami damage March 11. Work had resumed Thursday to cool the Fukushima plant's reactors after dark smoke spewing from the Unit 3 reactor forced a complete evacuation and halt to those efforts a day earlier. Meanwhile, workers doled out bottled water to Tokyo families Thursday after residents cleared store shelves because of warnings that radiation from the Fukushima plant -- 140 miles away -- had seeped into the city's water supply. Anxiety over food and water supplies surged when Tokyo officials reported Wednesday that radioactive iodine in the city's tap water was above levels considered dangerous for babies. New readings showed the levels had returned to safe levels in Tokyo, but were high in two neighboring prefectures  Chiba and Saitama. "Yesterday the water was bad, but today it's okay? It's very difficult to believe what they say," one man in Tokyo lamented to CBS News correspondent Bill Whitaker. Another Tokyo resident, a woman carrying her infant in a chest sling, worried more about the long-term. "This radiation is invisible," she told CBS News, expressing concern that her daughter's health could be affected decades from now. "The first thought was that I need to buy bottles of water," said Tokyo real estate agent Reiko Matsumoto, mother of 5-year-old Reina. "I also don't know whether I can let her take a bath." Government spokesman Yukio Edano sought to allay fears over the tap water readings. "We ask people to respond calmly," he said at a briefing Thursday. "The Tokyo metropolitan government is doing its best." Households with infants will get three, half-liter bottles of water for each baby  a total of 240,000 bottles  city officials said, begging Tokyo residents to buy only what they need for fear that hoarding could hurt the thousands of people without any water in areas devastated by the earthquake and tsunami. Nearly two weeks after the magnitude-9 quake, some 660,000 household still do not have water in Japan's northeast, the government said. 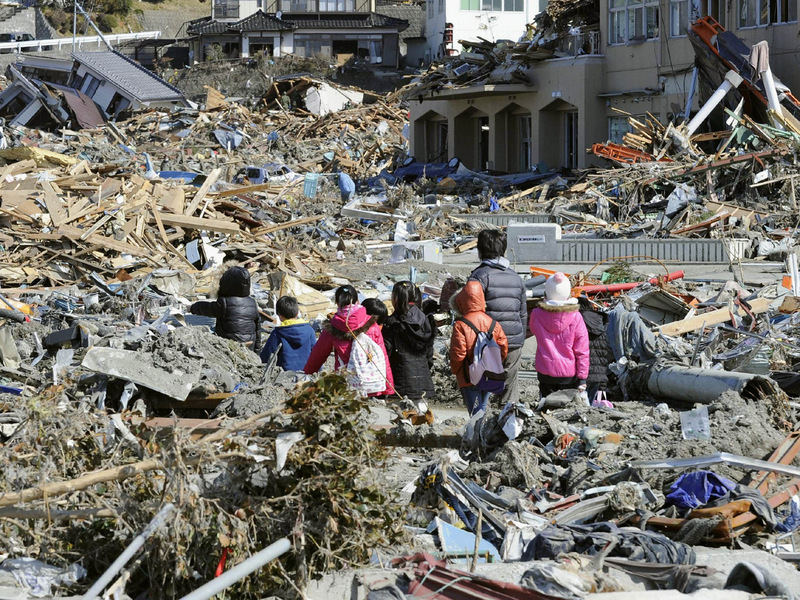 Electricity has not been restored to some 209,000 homes, Tohoku Electric Power Co. said. The figures were a reminder of the grim humanitarian situation that hundreds of thousands continue to face in the wake of twin disasters that are proving to be the most costly natural disaster on record. Damages are estimated at up to $309 billion, the government said. The number of dead and missing continued to rise: 9,700 dead, with another 16,500 missing, Japan's police agency said Thursday. The figures that may include some overlap. Hundreds of thousands remain homeless, squeezed into temporary shelters without heat, warm food or medicine and no idea what to call home after the colossal wave swallowed up communities along the coast and dozens of strong aftershocks continued to shake the nation. Fears about food safety began to spread overseas as radiation seeped into raw milk, seawater and 11 kinds of vegetables, including broccoli, cauliflower and turnips, grown in areas around the plant. About In 25 miles northwest of the Fukushima nuclear plant, levels for one locally grown leafy green measured 82 times the government limit for radioactive cesium and 11 times the limit for iodine. The U.S. and Australia said they were halting imports of Japanese dairy and produce from the region; Hong Kong said it would require that Japan perform safety checks on meat, eggs and seafood, and Canada said it would upgrade controls on imports of Japanese food products by requiring documents verifying their safety. Concerns also spread to Europe. In Iceland, officials said they measured trace amounts of radioactive iodine in the air but assured residents it was "less than a millionth" of levels found in European countries in the wake of the 1986 Chernobyl disaster. The overall situation at the Fukushima plant remains of serious concern, the International Atomic Energy Agency said. Levels of radioactive iodine and cesium across 10 prefectures was generally on an upward trend, said Graham Andrew, senior adviser to IAEA chief Yukiya Amano. In Fukushima, nuclear workers have struggled for days to stabilize and cool down the overheated plant. Edano said workers were laboring steadily and the situation was "not urgent." "As of now, the important thing we have been working on is to prevent deterioration. We should not be too optimistic," he said. "We are moving cautiously." Worrisome Unit 3 has finally stopped belching black smoke, a Tokyo Electric Power Co. spokesman said Thursday, a day after a plume forced an evacuation of nuclear workers. However, white smoke was rising intermittently from two other units, spokesman Masateru Araki said. Officials have evacuated residents within 12 miles of the plant and advised those up to 19 miles away to stay indoors to minimize exposure. Radioactive iodine is short-lived, with a half-life of eight days  the length of time it takes for half of it to break down harmlessly. However, experts say infants are particularly vulnerable to radioactive iodine, which can cause thyroid cancer. Tokyo tap water tested earlier in the week with 210 becquerels of iodine-131 per liter of water  more than twice the recommended limit of 100 becquerels per liter for infants. Another measurement taken later at a different site showed the level was 190 becquerels per liter, and was down to normal levels on Thursday. The recommended limit for adults is 300 becquerels. But tap water in Kawaguchi City in Saitama just north of Tokyo showed 210 becquerels of radioactive iodine, Shogo Misawa, a Health Ministry official, said Thursday. Tap water in another area next to Tokyo, Chiba prefecture, also showed high levels of radiation in two separate areas, said water safety official Kyoji Narita. The Chiba government warned families in 11 cities in Chiba not to feed infants tap water. "The high level of iodine was due to the nuclear disaster," Narita said. "There is no question about it." The limits refer to sustained consumption rates, and officials said parents should stop using tap water for baby formula but that it was no problem for infants to consume small amounts. The amounts are too low to pose any real risk, even to infants who are being fed water-based formula or to breast-fed infants whose mothers drink tap water, said Dr. Harold Swartz, a professor of radiology and medicine at Dartmouth Medical School in the U.S.
That was small consolation for Reina's mother. "I had had this premonition that such things could happen when this nuclear power plant accident broke out," she said. "And, I really don't know what I can do now. They had been saying we would be OK. But, now this is happening and I really don't know what we can do."